If any picture says 1,000 words about race, this is it. Several days ago, when the mayor asked for protests to be placed on hold, I'm almost positive he wasn't thinking of protests from the police themselves. Since then, a few hair brains who claim to speak for cops everywhere actually rented a plane (a plane!) and flew it up and down the Hudson River (up and down the Hudson River!!) in hopes of protesting the mayor. 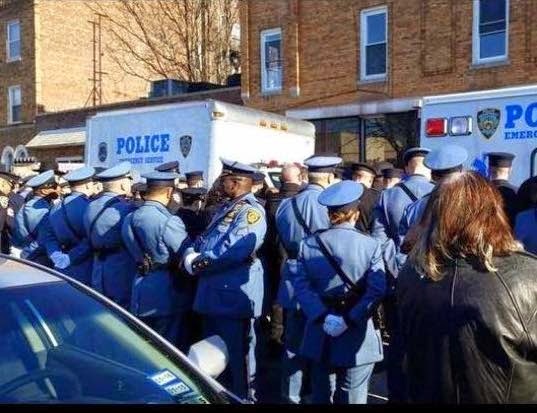 And hundreds of police outside the funeral of Officer Rafael Ramos turned their back on a TV carrying an image of the mayor (his image --on TV screen!!!). While the Mainstream Media carried that last story far and wide, this one photo had to make its way to me through social media. "Not all cops turned their back on the mayor" wrote one Facebook friend. 1. They all matter. Call me when the lunatics are stifled and sensible, reasonable discourse can be brought back to center stage. 2. The Mayor of New York City is the true hero here. He's done a remarkable job keeping the city from falling over the precipice -despite thirty extremists calling for dead cops on Youtube and despite, as Raginghorse Blog intelligently notes, some members of the PD today "chose to politicize murder and to do so at what is meant to be a sacred ritual". Despite all of this, the mayor is holding it together. Great job. I just want to be clear about one thing: I support the protesters through this. We live in a world that isn't just for African-Americans; one where not much has changed since before 1954 and one that has to change soon. I don't support chants like these (in fact I despise them), but to think that the 20 or so idiots who said this define a movement which seeks to correct a terrible injustice is foolish at best and dishonest at worst. Like him or not NYPD union leader Pat Lynch is doing what my Union leader has never done, speaking up and defending his rank and file. They organized job actions, went to the press, used social media, mobilized their delegates, and everyone spoke up for the PBA. They coordinated a media blast, turning their backs on a mayor who they feel betrayed them.... PBA members pooled money together and flew a sign over New York City attacking mayors. Say what you will, but every NYPD officer knows that their leader got their back. Police offers are closing ranks in New York City, they are defending each other. Officers are flying in from all over to show solidarity with their brothers. Now compare this our teachers union. The mayor and governor stick an evaluation down our throats, we say thank you, in fact we ask for more. We demand 22 components and test based evaluations, even when our parents don't want it. Common core standards, which were created without one actual teacher, UFT president says he'll punch anyone who tries to take it away from us, even though teacher after teacher hates it. The mayor closes down schools and the profiteers come in to take up space, our Union leader says no problem. He even decides that we're going to get in the business of running charters. Contracts canceled in Philadelphia, unions destroyed in Wisconsin, schools closed en masse in Chicago, no one in the UFT cares. We can't can't even get the members from one school to show up to a protest against co-location at a public school 5 blocks away, never mind fly across the country. 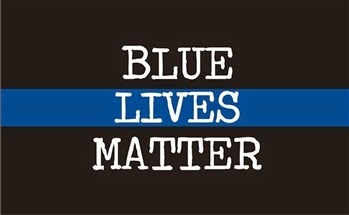 Here's the deal, don't like him, don't agree with him, doesn't matter: every PBA member knows Lynch and the officer standing next to him has his or her back. Go ask the average UFT member if they feel the same about Mulgrew, we all know not one of the 80,000 will say yes. PBA is winning the public relations battle, they have the mayor scared, and no way are they settling for the garbage contract now that the UFT got. Like it or not, Pat Lynch is showing you what a Union leader looks like. This is what a real teacher is. So good I had to share it. 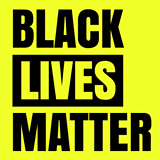 After the grand jury decision was released on the Mike Brown case and following the protests that have taken place in New York, a few of the teachers decided we have to do something. Actually the decision to do something about racism began a few years ago when teaching my criminal law class a young lady broke down and began crying about how she was stopped and frisked on a regular basis. From that moment until now we have been struggling with what we can do to try to bring some racial justice to our school, our city, our world. This past Thursday, the day after the grand jury decision in the Garner case was announced, we decided to have an after-school discussion where our students were welcome to express their feeling on recent events in Staten Island, Ferguson, and their thoughts on race relations. I sent my principal an email Wednesday night asking to have this after-school discussion. He promptly answered back “let’s have a meeting in the morning.” The meeting went well, we set norms and created some questions we would use in facilitation. I did sense some hesitancy to have this after school from my administration, understandably so. They wanted to make sure it was handled in manner that would make all our children representing various view points feel safe. Carmen Farina had written a letter on Wednesday night to principals encouraging schools to have events like the one we were planning. That letter helped tremendously in allowing this event to take place as I was able to refer to it several times in our planning session. Why Are Our Copays Going Up!!??? Just Some Quick Information About How the Scores will be Compiled.